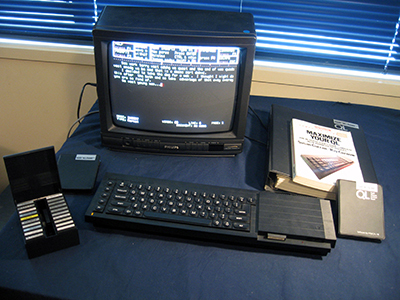 Low-cost Sinclair Research home computers such as the ZX-81 and ZX Spectrum had taken the British market by storm during 81-83. At this time, rumours swirled in the computer press that the company was working on a super-advanced business computer, one which would be innovative and brimming with advanced technology, ushering in a new dawn of price/performance capability! This wonder computer was the Sinclair QL. Highly anticipated and highly hyped (at least in the UK), this micro is a textbook example of how NOT to develop and market a mid-1980s computer. That's why I wanted this (infamous) computer in my collection. Poor R+D management combined with a premature release and over hyperbole lead to what can only be described as a debacle. Sinclair Research and the QL never recovered. I remember the hype and anticipation in the New Zealand computer press. It made me want one! Hindsight is always 20/20 vision and I'm very glad I didn't shell out thousands when they first arrived here. My impressions now I have one? Notwithstanding that Linux inventor Linus Torvalds learned to program on a QL as did many others (and I'm sure have fond memories of the machine), to me it appears the proverbial "dog's breakfast"! Had I been a reviewer back in the day I would have taken off my rose-coloured spectacles (which many wore) and savaged it. Clive Sinclair promoted this as a business machine yet (early model firmware bugs aside) it has a poor keyboard, a confusing DOS (QDOS) and an unreliable, slow, proprietary and idiosyncratic storage mechanism (microdrives). It doesn't even have a centronic parallel port which was the standard printer interface for business micros at that time! To top it off there isn't even an on/off switch!! Much was made of the 32-bit Motorola 68008 CPU and 128k RAM but the truth is these are hobbled by an 8-bit bus, slow storage media and bloated Psion software which was a port to the QL, rather than having being written specifically for it. Too highly-priced and lacking a software base for the home market, too buggy (at the time of release), idiosyncratic and propriety for the business market the QL was a quantum leap in rushed product, poor development, hyperbole and vapourware.